If watching a pug scoot and scamper around in a Wampa costume already made you clutch your heart and giggle at your desk this week, then prepare for the next wave of adorable, nerdy pets. Steampunks are known for taking extreme care with their elaborate costumes, from the mini top hat perched jauntily atop their heads to the buckled and cog-adorned lace-up boots on their feet. So it's only to be expected that their pooch be dressed to the clockwork nines as well, right? Enter one of our favorite phenomenons, the steamcritter. 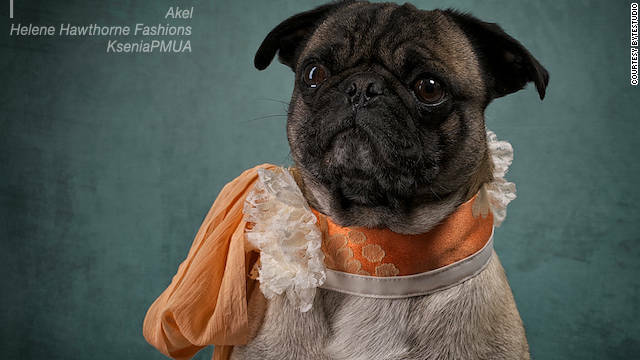 While you may not go all out and dress your dog in a top hat, embroidered vest and tie - like Krusher the steampunk gentleman - you can always perk up your pooch with a frilly lace collar that would match any personal brand of steampunk. Kristine Hawthorne sells steampunk gowns in her Etsy shop, Helene Hawthorne Fashions, but she also has some frills for Fido as well. We took a moment for a cyber chat with Ms. Hawthorne about her lace collars and why she started putting them up in her store. CNN: I've seen your historical costumes for women, but when did Dandy Dogs come about? Hawthorne: I thought it would be fun to do some shoots with small dogs so I made some collars too match with the models outfits. CNN: Is there a lot of interest in your Dandy Dog items? Hawthorne: The pictures got tons of positive feedback but I have not really put very much effort into selling the dog collars as of yet. CNN: What do you think makes people want to dress up their dogs like this? Hawthorne: Lots of different reasons but mostly because we love our pets. CNN: Do you see a trend in people dressing up their dogs to match their steampunk or historical costumes? Hawthorne: Yes, dog clothing and costumes for Halloween are more and more popular every year. CNN: How did you come up with your designs? Hawthorne: Like all my other designs I find material that inspires me and go from there. CNN: Do people send you pictures of their dogs wearing these items? Hawthorne: Not yet, but I would love to see some. CNN: Any future plans for adding more items like this to your site? Hawthorne: Maybe after the Holiday season when I have more free time to devote to it. I would love to do some more shoots with pets. certainly like your website however you need to take a look at the spelling on quite a few of your posts. Many of them are rife with spelling issues and I to find it very bothersome to tell the reality nevertheless I'll surely come again again.